Imagine navigating with your eyes shut around a room full of people who are singing the same song, but at different speeds; you have a guide who holds your hand, and you must follow them by listening to their voice. This was the exercise that made the biggest impression on me at Myriad’s recent vocal workshop. It wasn’t hard to latch on to the excellent tenor voice of my guide, but it did make me really listen, and it was magical to be steered through the cloud of sound created by an informal cannon of “Are You Going to Scarborough Fair”. Myriad is a newly-formed project choir of keen and confident amateur singers, under the professional musical direction of David Todd. We perform in a small ensemble (16-20 singers) where every voice counts. As part of preparations for our third concert, and as we get to know each other as singers, we asked Suzi Zumpe to lead a workshop focusing on tuning and blend. Suzi is an experienced choir director, vocal coach and professional soprano and we spent just three hours with her at the workshop. She took us through a series of exercises, all of them intriguing, with laugh-out-loud moments. These included learning by ear several canons, and improvising one – a challenge, in a really positive way, for singers like me who are used to relying on (hiding behind?) a score. Suzi has a beautiful soprano voice which she used to demonstrate in the moment. The impact on our singing was clear. After the workshop we sang some of our concert repertoire and it seemed to me our sound was more liquid, more sensitive and more together than we’ve previously achieved. The key message I took away is that singing is as much about listening as it is about production of sound. 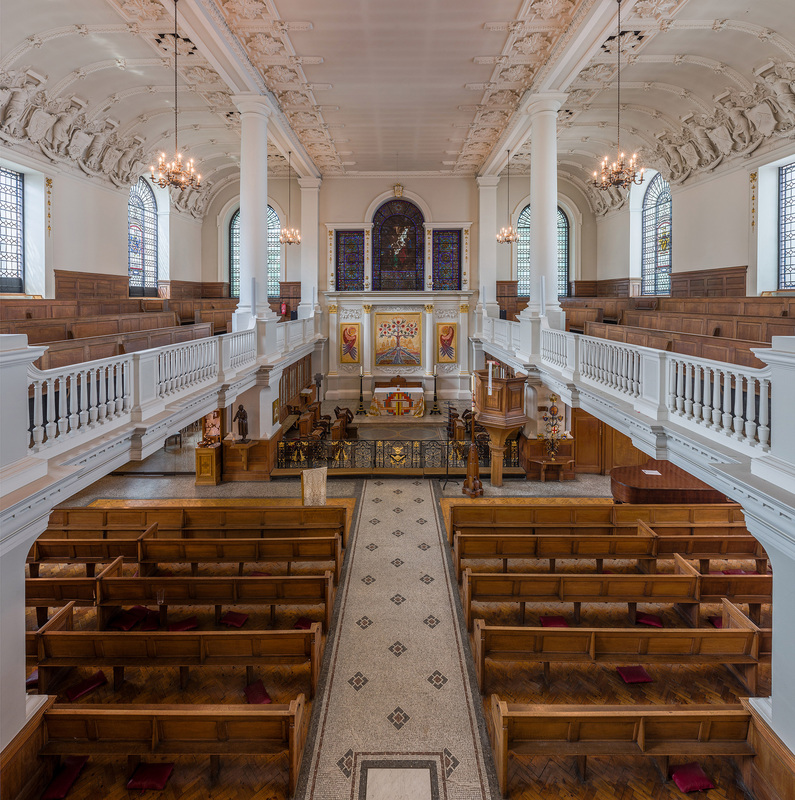 The scene was set last November in the church of St Stephen’s Walbrook in the City of London as candles adorned the pillars, and the audience, some of whom had been part of the Lord Mayor’s Procession earlier that day, waited for the choir to enter. I was so glad we had chosen the church as it had its own links to the Great Fire of London, which we were commemorating in our performance. 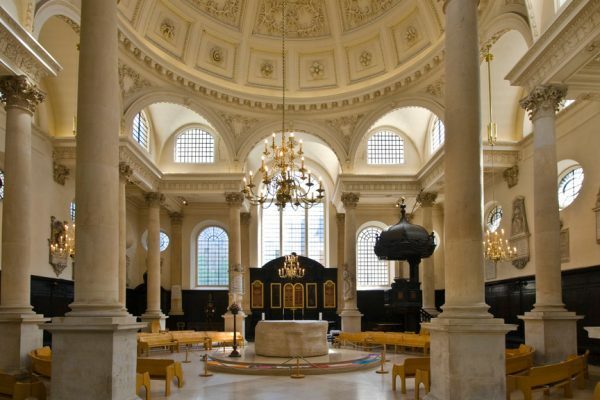 The church had been rebuilt by Christopher Wren after the fire, and lay not far from the monument to the victims. The church also enabled us to do the concert in the round, meaning that the audience formed a circle around the central font. That gave Myriad plenty of opportunity to use the space creatively in our presentation of the words and music from the time of the fire, something we are aiming to do more and more as we explore different ways of presenting our favourite music. Entering with ‘London’s Burning’, which was helped along by the audience, the story of the fire began with the first reading by John Hocking, who throughout the night enlightened us with stories from the time of the fire from figures such as Samuel Pepys and John Evelyn, all of which had been carefully chosen by soprano Melanie Mehta. 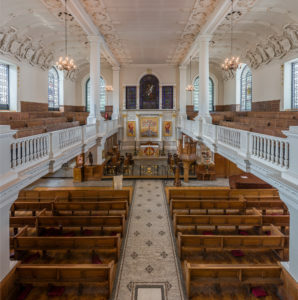 The music ranged from pieces with texts associated with fire set by composers such as Gesualdo and Monteverdi through to present-day Morten Lauridsen, as well as pieces that would have been heard in London at the time of the fire. We were grateful to have been joined by Keith Bramich on tam-tam at the end of the second half for our performance of John Tavener’s rarely-performed work ‘The World is Burning’. This wonderful, brooding work featured a semi-chorus at one end of the church, with the main choir at the other, all bound together by bass Stephen McCarthy’s powerful bass voice as the figure of Christ. It was a pleasure for me to work with all of the musicians and John, to bring about this moving commemoration of the 350th anniversary of the Great Fire of London. One of the things I wanted to bring to Myriad when I became their conductor was innovative programming that made sure the works we performed had an engaging theme or thread running through them. I’ve been to many concerts in the past where little thought has gone into this area, which I think is a real shame because for me, works can enlighten each other if they complement each other well. One example is in Myriad’s last ‘London’s Burning’ concert, when we performed two settings of the same text by composers Monteverdi and Lauridsen. Though these composers are separated by hundreds of years, it was fascinating to see what they did in terms of setting the text that was similar, and different. To programme well can take a lot of time however. One can end up being so bound by a chosen theme that you end up choosing inferior music just to fit the theme, or you find what seems like a perfect piece, but then realise it needs an orchestration which just isn’t going to be feasible with the resources you have available. To begin working out Myriad’s spring concert, I already had the idea of poets in my head from the installation of a plaque in Poet’s Corner of Westminster Abbey to Philip Larkin. A concert with texts by well-known poets seemed an idea that could work really well, and also offer plenty of interesting choral works. It could even open the idea of collaborating with a living poet as well. Finzi’s setting of poems by Robert Bridges seemed a natural start, and that led me to similar composers in his style. I’d also wanted to include works by Deborah Pritchard in one of our concerts for a while and hoped that she might be able to write a new work for the choir. I knew she had recently composed a setting of ‘My Soul there is a Country’ that would also link to Parry’s wonderful setting. And before long, I was struggling to make sure programme wasn’t too long, which is a nice problem to have! I’m looking forward to starting work with the choir on our next project in February, and hope you will enjoy coming to the concert.